The Gallery is in Maiden Lane , Stamford and offers art from mainly local artists and has an excellent picture framing service. Beverley, the owner, has a number of my pots on display and for sale. 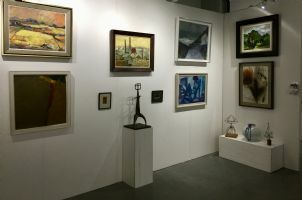 The fair took place in February 2019 in The Mall Gallery, The Mall, London. I had four of my pots on the Stamford Fine Arts stand courtesy of Jeff Stone. Jeff sold two of them - my first sale in a London exhibition. The last Anglian Potters meeting and demonstration featured Craig Underhill. It's always interesting to hear how potters have developed their career and to see some of the techniques used in their work. Craig was an excellent presenter and very generously shared his knowledge. The annual Stamford Potters Market will be held this year on 5th and 6th May in the Art Centre. Around twenty potters from the area will be taking part exhibiting and selling a wide range of work. I have been invited to join the ESC (Escape the Ordinary) Artists events for 2019. I'm taking part in the autumn exhibition which takes place in the Art Gallery, Stamford, from 21st October to 3rd November. A "pop up" art gallery is opening in Uppingham from the 2nd to 23rd March. Work from over forty artists will be in the gallery including some of my pots. The "pop up" art gallery is open again in Uppingham from Friday 8th April. The first one was a great success with some very complementary comments from visitors. I was fortunate to see seven of my pots, three of which went to France.